I Miss My Tivo - User interface matters! I miss my old Tivo. With so much attention paid to the user experience throughout the interface design, Tivos are a pure pleasure to use. You always feel in control, and wonderfully empowered. Ahh. But then, problems. Some of them technological - not being able to dial up over VoIP lines, compatibility issues with combined cable and internet signals. Some feature set shortcomings, like the single tuner and smallish recording capacity. And some just related to an aging box - glitches, freezes. Aww. And then there's the Comcast DVR box... I like that I don't own the box, so the really nasty problems are Comcast's, not mine. I love the dual tuners; and when I switch to HDTV, the box will automatically switch with me. But dear God, this thing has no idea how to treat its users - menus laid out by what must have been monkeys playing with half of a flowchart set, inexplicable delays with no feedback whatsoever until the flurry of button-presses that follows, and graphics that would have made for a mid-range GUI sometime in the late 1980's. And my favorites are the really, truly bizarre gems that I'm blessed with from time to time. See that photo? 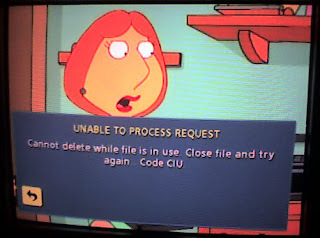 In the middle of yukking it up for another episode of Family Guy, this popup pops up - I didn't try to delete anything, I don't want to delete anything, and I'm sure as hell not going to "try again!" AAAAH! So I want to root for Tivo in the DVR biz, but there are certain realities that make it tough for an independent player. Comcast has the infrastructure and installed base of customers to be able to offer a leased rather than purchased box, to make the integration with cable programming and billing more seamless, and so on. But there's got to be some value placed on user experience - or we're all going to miserably slog through our recorded lives, cursing the DVR drug to which we're addicted. Tivo's current foray into developing software and interfaces for others' boxes is probably the best bet, and I hope it works out. Because mostly, I just miss my Tivo!